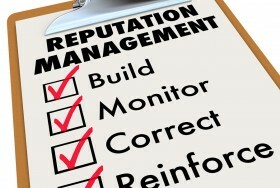 Reputation management isn't something that goes away with time. In fact, it's actually something that grows and scales in complexity. However, through proper management and automation anyone individual, brand or business can have much better control over what is being said and found about themselves online. Since the internet and the number of people accessing it continue to grow at a rapid pace, it's more important than ever to make sure you have a reputation management plan in place before something actually does happen. For any existing professionals, brands or businesses, you can consider this an insurance policy -- because the moment something does happen, you don't want to be running around trying to figure out how to clean up a disaster and not know how, when and where to start. With all of this in mind, it's important to understand how other businesses and brands around the world are affected by their online reputations as well. Through multiple online reports and studies, we've compiled a great set of stats and industry figures to help you not only better understand why your online reputation is important, but also how to better protect and manage it in the process. Before talking about the process of monitoring and managing an online reputation, you need to first decide what type of asset you are trying to protect. This is usually your personal name, a brand, business or product. While each of these assets will need to be protected differently, the way people search and find information about them will likely stay the same -- which is through the internet. To kick things off, let's first take a look at the some of the most important stats in the industry today, as pointed out via Business2Community. Each of these numbers will help you better understand why what people find online around your personal or brand name is so important. - 85% of consumers claim to read online customer reviews for local businesses. - 37% of consumers use the internet to search for local business at least once monthly. 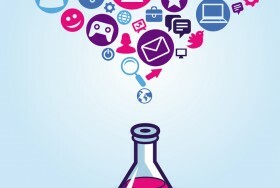 - 65% of consumers prefer brands that have a plurality of good online reviews. - 79% of consumers consider online reviews to be equally as trustworthy as personal recommendations. - 71% of consumers say positive reviews increase their trust of a business. The clear takeaway here is that everyone is using the internet to search for reviews, coupons, and information before buying a product. At the same time, they are also sharing this information with others, further influencing what is being said or promoted about such individuals, brands and products. In fact, these numbers are so impactful towards the bottom line for many businesses, that clients investing in online reputation management services can be paying up to $5,000-$25,000 a month, as reported by Business Insider. A common question to ask when considering the costs of ORM, is how might such contents found online be representing your brand? Another industry that has been completely transformed through the use of online reviews and now needing to worry about their reputation management is local businesses. BrightLocal released their own in-depth report that breaks down nearly every facet of reputation management. One such statistic is on what type of local businesses are being searched for online more than others. As expected, restaurants are at the top of the list, while professional services and hotels fill in the rest of the list. With sites like Yelp, TripAdivsor and Google Local ranking at the top of the search results for nearly every local business, it's important to make sure all reviews and comments are not only monitored but also responded to should they be portraying a negative light on your brand. With over a billion active sites on the internet and over three billion users spread across all of the major social networks, it would be quite impossible to try and monitor your online reputation without the help of reputation monitoring tools. We've listed some of the most recommended solutions from industry experts for you below. - Google Alerts - A free tool provided by Google, that will send daily email alerts whenever your specified keywords appear within new content in Google. 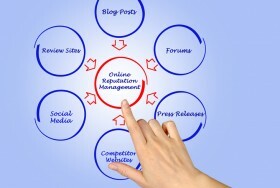 - SocialMention - To get a full grasp on your brand mentions online, you will need to look beyond just the search results. Social Mention is a free tool that allows you to easily search, track and measure brand mentions across not only social networks, but also news sites, blogs and other media outlets. - Trackur - Trackur is an advanced online monitoring tool that was created by ORM expert, Andy Beal. Setup social media monitoring and have access to instant notifications when your name, brand or keyword is found across any of the major social networks. Each of these solutions are unique in their own way. The common benefit is that they will allow you to receive notifications every time your name, brand or specific keywords appear within the search results, social media or across the internet. The key takeaway to successfully tracking, monitoring and improving your reputation online is all about management and scalability. While there is going to be a never ending supply of content on the internet, through the use of preparation and software automation, the process is more attainable than ever before. Tim, great article, loved the stats. 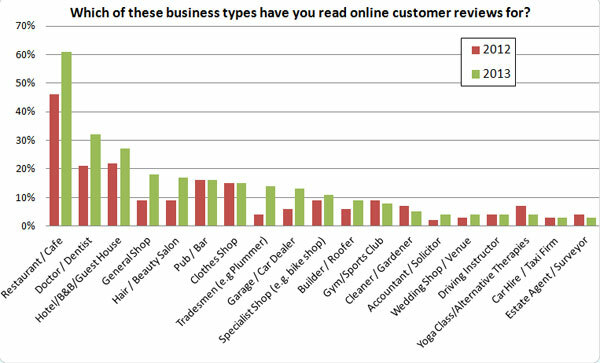 I like how you spelled out which business types depend on the most reviews. Would love to see a longer list like that in the future.